This is an excellent and well cared for park. Sites are level and long enough to accommodate a large motorhome with a tow. Owners are wonderful and you will be guided to your site and they will offer assistance if you require it. They are knowledgeable as to what satellite companies work in which site. Wifi is available, however it is Montana folks and wifi simply isn't that fantastic rural areas. There is a wonderful meadow for practicing your golf swing, playing Frisbee golf (9 holes) or exercising your dog. There is a heated pool, a kids play area, horse shoe pit, volleyball/badminton net. They have a lot of activities for guests, adults and kids alike, especially on holiday weekends. There is a small store on the property that features Made In Montana products, yum they are fantastic! You can't go wrong staying at the Nugget RV Park. We stayed in a class A Motorhome. If I could give this park more than a 5 stars I would definitely do it! This is one of the best RV Parks we have ever stayed and we full time and been to many RV parks across the US. The owners takes pride in the park and it shows. They guide you to your spot in a golf cart. This park is a big rig friendly park also. Restrooms/showers were spotless. I have been bad about writing reviews. But after staying here that changed. You will not be disappointed about staying here. We stayed here a month 7/21/17 to 8/20/17. Absolutely fabulous campground! So pristine! Great location! Very friendly helpful people! Would stay here again! I really liked this campground. It had lots of big trees and the gravel was well packed and level. We really enjoyed the swimming pool after the 100 degree day, the pool was perfect temperature. We stayed at this sight two times in July and even though it was not far off the highway, it was very quiet. We stayed at the nugget campsite in a 38 ft fifth wheel. Coming into the entrance was nice but notice lawns needed to be mowed. We also notice trees and bushes was not kept up as they usually are at this site. We found out the owners sold the camp last September. We was really sad to see they left. So far the sites was level and nice just like always. The lady at check in was nice and pleasant. Found out she was the daughter in law of the new owners. The person that took us to our site was not very friendly and did not even stay around to see if we had questions. He point at the site and said good night. This was an older person I hope he is not the owner. We always walk our dogs on the trails because they was all ways well maintained. Well this time they was in terrible condition. They had weeds ankle and knee high. Very disappointed in the maintenance on these trails. We will stay again and hopefully the new owners will maintain the park as good or better than the previous owners. They was 10 across the board in my opinion. We spent a night there and did not see one person drive around checking on things in the park. The previous owners always was out on the sites checking around. Wonderful campground to spend the night. Very handy to I-90. Lots of work going on to upgrade, but it is already very nice. Great location in forest. Definitely stay here again. The park itself would have gotten a much better review from me. It is nice and very well maintained. However, there were a few things that really bothered us. Number one, you have to pay 5 dollars per person for guests visiting you. Our main purpose was to see family that we have in the area so we had to pay for everyone that visited us. That amounted to quite some extra cost. They were usually inside our 5th wheel and only there for 2-3 hours. Number 2, since we knew we would have our family visit us pretty much daily, we tried to cancel and move to another campground. They have a 1-week early termination fee meaning that the day you cancel you have to pay for one week more as the owner explained to us. Also don't go there if you have OTA reception for your TV. There is no TV signal and the internet is very slow and often not available at all. We stayed here on August 27th. The owners are very nice and helpful and you can see that they take pride in their park. 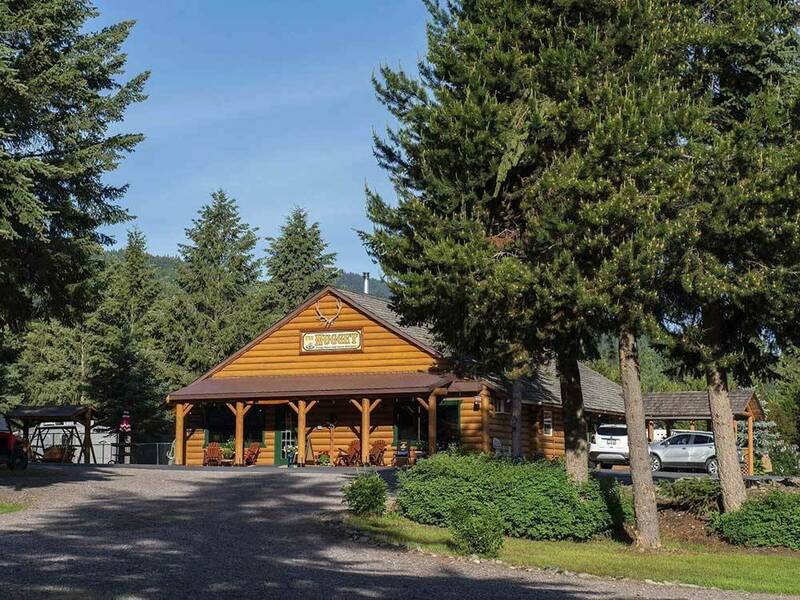 The only 2 things that would make this RV Park better would be more trees for shade and that will take years for them to grow, and a better wifi signal to all of the campsites which could be done very soon. Wifi is very important for some people because of needing to work as they travel. This is a nice park to stay at because it is right off of I-90, but quiet. There are trains in the distance and they are not too loud when passing by. We will put this park on our list of favorite parks to visit again when traveling through Montana. Owners have choked the Wi-Fi to very limited access. At registration you are told "no streaming". "Streaming is blocked". Forget Netflix etc. No cable TV . No local TV reception. If you don't have satellite, you are pretty isolated from TV or streaming options for entertainment. Hands down the nicest campground we've stayed at! Very clean and perfectly maintained! Wide sites that are angled for nice privacy. I do not usually give 5 stars but this is the cleanest nicest park we have stayed in. Owners very help full and polite. Stayed here for a week for our "maiden voyage" in our new 5th wheel. The people are very nice, the grounds are well kept with mowed yards and beautiful flowers, very clean. The pool, restrooms and showers are exceptionally clean. There are lots of activities available - miles of walking/biking trails, horseshoes, driving range, children's playground, beach volleyball. FYI - not all spaces have fire rings, and there are no local tv stations. Movies available for rent at the campground and in town. This is a great place to stay!! What a gem! Beautiful groomed spacious sites with mature trees, green grass, hiking trails, nice pool, laundry room and friendly staff. It showed the love that has gone into making this RV Park special. Also for the golfers there was a 9 hole course just a short distance down the road. We were only there for two nights. But we will visit the nugget again and plan to stay longer next time. Nugget RV Park lives up to it's name. It is a Nugget! A gem of a place to enjoy the natural beauty of Montana. The owners (the kindest people) take pride in their park and it shows. The trails are well defined and our Rhodesian Ridgeback Zowey Loves to run and play in their off-leash dog park. Facilities are always kept clean and the park setting is serene. Nugget RV Park has become our favorite park in Montana!